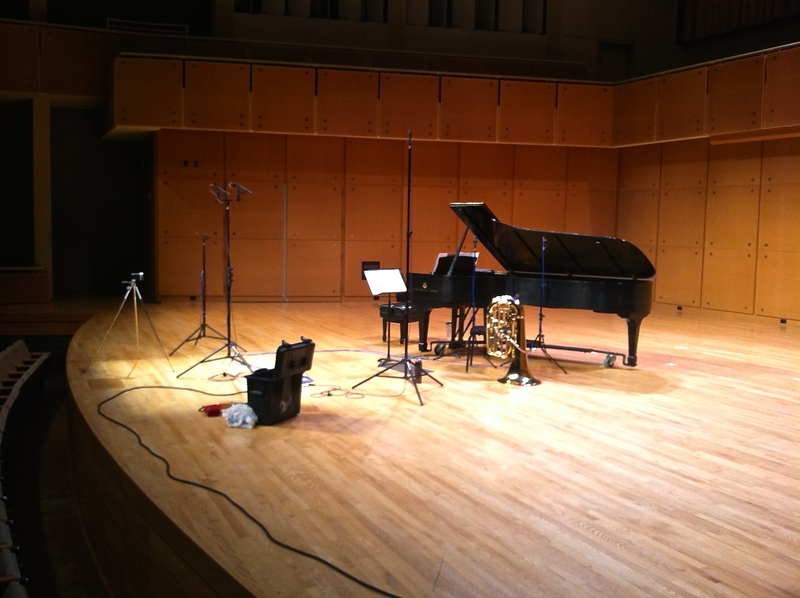 9:30 -10:30 am – Arrival, warm up and recording equipment set up. Overall, the recording session went very well. Despite the intitial buzzing light fixtures, the hall and the piano sounded amazing, and Alan Huckleberry’s playing was impeccable. The sound engineer, Andy Bove from Bove Audio, is an old friend and has recorded the last few Atlantic Brass Quintet recordings. Along with Andy Rummel, our host at ISU, they served as producers, or “tonemeisters” helping us ensure we covered everything. Andy also played tuba on the Owen trio, which we will be performing, along with Alan at the Midwestern Regional Tuba Euphonium Conference at Bowling Green State University of Ohio in May 2015. Alan and I will also perform I Think I Shall Buy a Black Horse and Four Painting by Grant Wood on that program. I suffered from a really painful ear infection from Dec. 23 to about Jan. 3rd and didn’t play at all during that time. We had below zero weather throughout the recording session, with wind chill factors around -30° F.
On the first day, I almost fell down a 10 ft. hill taking a short cut while walking from the parking garage to the Performing Arts Center in the bitter cold. While walking along the shrubs to avoid falling down the hill, I scraped my face and after recording for about two hours, I discovered seven berries from the bush which had fallen into my tuba. This recording was made possible with generous support from the University of Iowa’s Office of the Vice President for Research & Economic Development, the College of Liberal Arts & Sciences, and the School of Music. Dr. Andrew Rummel, Assistant Professor of Tuba and Euphonium at Illinois State University in Normal, Illinois. Andy Bove, Producer/Audio Engineer at Bove Audio. Well done! I look forward to hearing the CD. I like your idea of keeping track of challenges. Interestingly, we were in the studio during the same week, so we shared some of those challenges – below zero weather, for sure! Also, construction next to the studio… Anyway – cheers, John! Thanks. I look forward to hearing your recording as well. Congratulations on your completion of what you have described as a very gratifying recording project. Which pieces were performed on F tuba and which, if any, were performed on CC? Steve, Thank you. I really enjoy playing, commissioning and recording new music that is beyond the typical repertoire. I played F tuba on all of the pieces on this recording, as I usually do for solo recitals. I use my C tuba exclusively in brass quintet.